Package Includes:Power supply with CPC port and voltage divider 200-600V CSA, 180° full length machine torch and 25' lead, and work cable. cutting mode and torch lead length for optimum cutting. •Smart Sense™ technology automatically adjusts the gas pressure according to cutting mode and torch lead length for optimal performance. • Boost Conditioner™ circuit (on CSA models) improves performance on low-line voltage, motor generators, and fluctuating input power. • FastConnect™ torches, CNC interface, and four work lead styles increase versatility for handheld and mechanized use. • Simplified control panel with LCD screen for easy operation. •15º and 75º Duramax™ series hand torches enable operators to easily select the right tool for the job. The handle is more heat resistant and performs at least five times longer in high impact tests than previous torches. 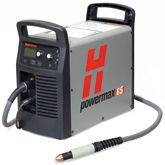 • Standard and short-barreled Duramax series machine torches allow a wide variety of mechanized applications with X-Y tables, track systems, pipe and robotic cutting systems. • Conical Flow™ nozzle increases arc energy density for superior cut quality with little dross. • Patent pending shield reduces dross buildup and enables smoother drag cutting for a better cut.